SEM Rush dropped some serious knowledge at this year's Digital Dealer 25 Conference. We've compiled our key takeaways from the talk. The Convertus team attended the Digital Dealer 25 Conference in Las Vegas last week for two days of all things automotive digital marketing. We brought back some golden nuggets of actionable insight for you. You’re welcome! One of our favourite talks was hosted by SEM Rush. Ashley Ward dove into some powerful dealership marketing techniques for maximizing click-through-rates with the most relevant, compelling ad copy. We’ve compiled our top three takeaways from her talk. Ad copy is an art form. 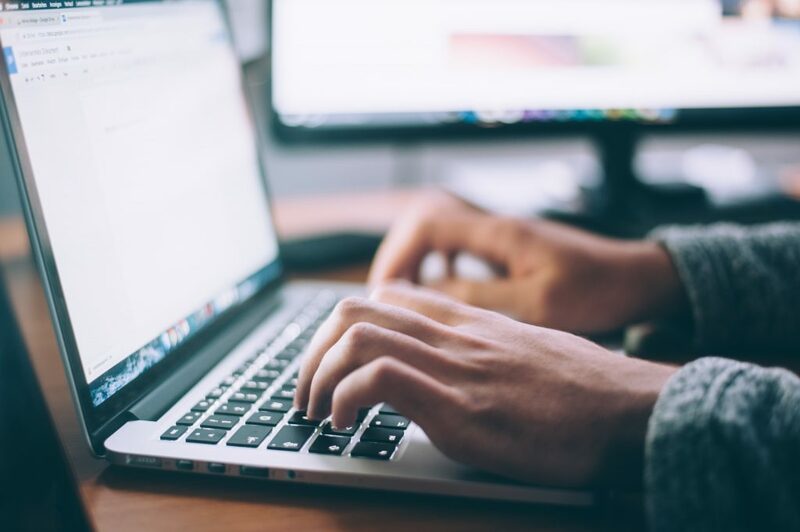 It’s okay if you’re not a word nerd, but try to find someone who is to help your dealership serve up the most effective content for your audience. Ashley shared some of her advice for successful ad copy. To each specific platform, medium and finely targeted audience segments. Each marketing platform has unique features that should be considered when writing ad copy – varying ad lengths, messaging tones, imagery and so on. For example, Facebook and Instagram are highly visual platforms that support cheeky humor and the use of emojis, while LinkedIn and search ads are best for concise, professional, direct ad copy. Tailor your ad copy to everything. Tailor, tailor, tailor. Never stop tailoring. Seriously. Consumers use emojis so often in their day-to-day communication that they’ve become a universal language of their own. When brands include emojis in their ad copy, it can dramatically improve click-through-rates across social media campaigns as well as open rates for email marketing. In email marketing, emojis in the subject line helps brands to stand out in a crowded inbox while on social media, they help to convey messages and emotions in fewer words. Use emojis to help humanize your dealership’s marketing messages and draw attention to your ads. Just be sure to consider what emojis will resonate best with your audience! Need more persuading? Check out Chevrolet’s wildly successful 2015 press release composed of entirely emojis here. And answer them, too! Questions encourage engagement and are an effective strategy to capture audience attention throughout their car buying journey. Asking questions without offering an answer can be a dangerous tactic, though. It leaves room for audiences to consider a negative answer. But, “Looking for a pickup truck? The Ram 1500 is the natural choice.” answers the question for the audience, avoiding the chance of negative response. As always, make sure your questions and answers are tailored to the specific audience segment you are targeting! Like prices, promotion dates and discounts. Including prices in your ads helps car shoppers decide whether they’re willing to click or not. Often, consumers scan for prices and promotions throughout their searches and click the most appealing offers. They’ve got a pretty good idea of how much they’re inclined to spend before they even see your ad. Further, including dates creates a sense of urgency (think “Offer expires December 31st!”) and encourages car shoppers to think quickly. Keep people from scrolling past your ads by separating lines of text, prompting curiosity and the urge to click “read more”. By encouraging users to expand and interact with your ad, engagement and CTR can improve drastically. You’re probably wondering what the heck ToFu, MoFu, and BoFu even are. 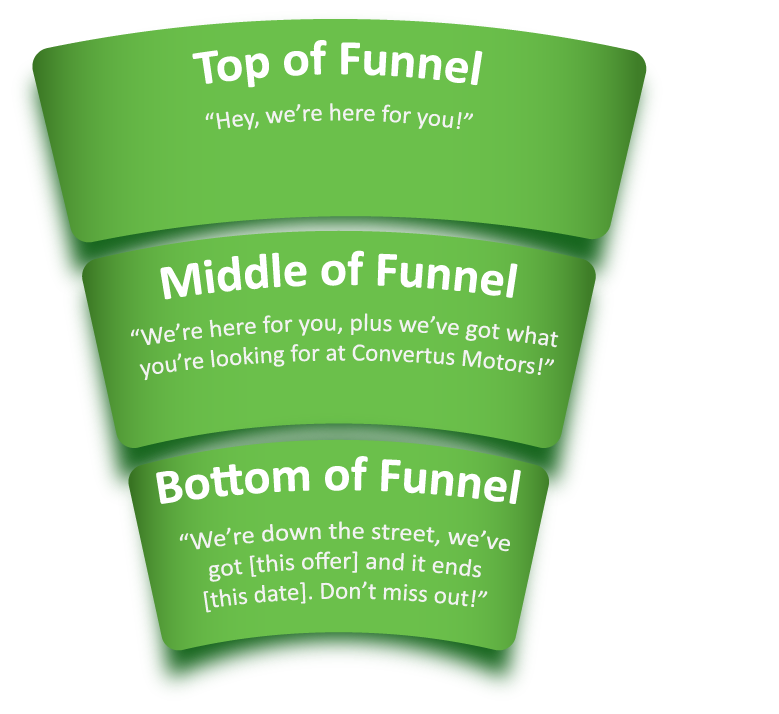 Aside from food, they’re marketing acronyms referring to each level of the inbound marketing sales path: top-of-funnel (ToFu), middle-of-funnel (MoFu) and bottom-of-funnel (BoFu). It’s important that your dealership serves up the most relevant ad copy at each of these levels to influence car shoppers in their decision-making moments. Effective ad strategies will guide car shoppers on their buying journey with finely tailored marketing messages and increasing aggression at each stage. Ashley Ward recommends that your dealership create three ads for each level of the funnel. Further, retarget each set of ads based on the previous level. So, MoFu ads will target those who engaged with ToFu ads, while BoFu ads will target those who engaged with MoFu ads. Get it? This way, your dealership is remarketing to audiences who have already shown interest in your business. When writing ad copy or designing creative assets for paid campaigns, consider that many (if not most) consumers will be interacting with your content from mobile devices. So naturally, visual elements should be designed in a way that’s compatible with mobile screens and copy should prioritize mobile users. 57% of Facebook users ONLY login on mobile. 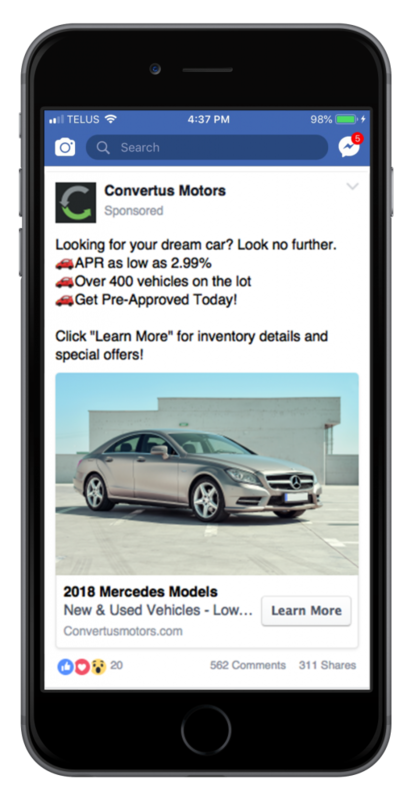 Your dealership needs to think mobile-first in all campaigns and designs! For better ad performance, always tailor your ads to the marketing platform and the people they’re targeting. Include attention-capturing elements like emojis, numbers, and urgency as well as curiosity-invoking tactics that encourage audiences to expand your ads. Your dealership has an opportunity to generate high-quality leads by offering relevant marketing messages for each level of the marketing funnel and adopting a foolproof retargeting strategy. Captivating ad copy that motivates clicks is one of our specialties here at Convertus. We’ll help your dealership craft powerful ads finely tailored to diverse digital marketing platforms. Further, we’ll help you identify and target audience segments to get more out of your investment. Reach out to us for any ad writing advice or to get a conversation started about how we can grow your strategy together.